Xena and Gabrielle's relationship hits a few bumps in CRUSADER. Praise the gods! How refreshing! Finally, there is a television show that is not afraid to show life, love, and friendship as it really is. I, for one, was thrilled to see that the third season of Xena: Warrior Princess was brave and bold enough to show us that we do not always have control of everything, and neither does the Warrior Princess. Sometimes the events of our lives just continue to spiral out of our control, and usually the only things that can hold us together are our friendships and love for those closest to us. I have never seen this point illustrated quite so emphatically until I viewed the third season's episodes. The episode THE DELIVERER (50/304) is a perfect illustration of this point. Xena's control seems to be complete for the first half of the show. The plans for defeating Caesar are flowing smoothly, and even when Gabrielle is captured and nearly killed, the Warrior Princess seems to know just what to do and when to do it to prevent Gabrielle's crucifixion. However, in the shocking conclusion of that episode, Dahak is the one in control, and Xena and Gabrielle's lives are thrown into turmoil. Gabrielle loses her blood innocence and is impregnated by Dahak. Xena gives up her fight against Caesar in order to rescue Gabrielle, only to find out that she is really too late to prevent the horrible things from happening to the bard. Xena's own passion for revenge becomes the thing that prevents her from protecting the person most dear to her. Things are definitely out of Xena's control, and she is only just beginning to realize it. At the end of this powerful episode, the only way that either woman can withstand the terrible weight of these events is to cling to the other for support. Xena cradles Gabrielle to comfort her and to help ease the internal pain of having committed her first killing. Gabrielle is really beyond thinking at this point. Probably the only thing that is registering to her is the feel of Xena holding and protecting her. No words can help her deal with her own guilt, but the presence of love and friendship helps to make it all a little more bearable. Things are at first deceptively calm in GABRIELLE'S HOPE. In the next episode, GABRIELLE'S HOPE (51/305), we can see that neither Xena nor Gabrielle is yet in control of the events they must face, and once again they must rely on their friendship to see them through the tough times. They just have to survive the rough spots together and trust that the love they have for one another will see them through. Gabrielle's pregnancy and the subsequent birth of Hope are overwhelming shocks, and this is understating the feelings both women must be experiencing as they try to comprehend what happened in Dahak's temple. Just as they are thinking that the events have gotten as bad as they can get, there is more trauma to face. Hope seems to be evil, and Xena feels that she must kill the child in order to prevent evil from entering the world. This is seemingly a neat and simple solution to the problem, except that this evil child just happens to be Gabrielle's. There is no easy solution at this point. The events that follow, though traumatic and deceitful at times, do not truly betray the friendship that has been established by the two women. It is still essential for them to BE together. Gabrielle does the only thing she can think of to save both her baby and her friendship with Xena, and that is to send Hope down the river in a basket. Xena, on the other hand, can sense that Hope is evil and will someday bring destruction to the world and possibly to Gabrielle herself, so her motivation for trying to kill Hope is to prevent further harm in the future to the ones she loves. Time will certainly reveal how prophetic Gabrielle's thoughts are as the events unfold in later episodes. How is it possible to deal with these decisions and these life-shattering events? The answer is simple, yet so complex: love and friendship. No force is stronger than these elements found in both women. As the Fates continue to toss challenges at our heroines, their friendship stretches, bulges, pulls thin, tears, but most importantly, it tenaciously continues. I was exhausted by the events involving Dahak and the subsequent conflicts, and it is not hard to imagine that Xena and Gabrielle were feeling the same way. Xena makes a late appearance in FORGET ME NOT. In a perfect imitation of real life, the writers of Xena: Warrior Princess did not "go soft" on the next events that occurred in Chin. The element of control is still not within the power of Xena or Gabrielle. In THE DEBT I (52/306), a perfectly peaceful campsite is disrupted by news that "the Green Dragon has gotten too big and must be made small". This sends Xena on a mission to pay back a debt owed to Lao Ma. She thinks she must murder Ming T'ien. Gabrielle is totally confused by the whole situation and, as we might imagine, is still reeling from the events of Dahak. Now, Gabrielle must refocus her energies toward preventing Xena from losing her way and returning to the path of darkness and murder. In addition, as we discover in FORGET ME NOT (63/317), Gabrielle is angry and hurt that Xena seems willing to throw away their friendship for this act of revenge and anger. For Gabrielle, the potential loss of Xena's friendship is more than she can bear, and this forces her to do things that she never knew she was capable of doing. Once again, the options for action presented to the characters are limited by the characters' lack of control. Xena has to respond to the debt she owes to Lao Ma, and Gabrielle has to try to save her best friend in any way she can. Neither woman has control of the situation in Ming T'ien's palace. Xena is a prisoner after Gabrielle stops the assassination attempt, and Gabrielle becomes a helpless bystander as Ming T'ien takes total control. When things seem the most hopeless and Xena is condemned to die the next morning, Gabrielle knows that she MUST regain her contact with her best friend, though she knows that, because of her betrayal, the encounter will be painful. Even during this time, when hatred could have conquered both women, the friendship helps them to overcome the traumatic events and find comfort in the midst of chaos. Their love allows them to see past the physical events and to understand the love that motivated the events in the first place. Each of them seems well aware of the fact that their friendship is what makes life worth living, and it is worth the work that is required to keep the friendship strong. The physical actions presented in the scenes in the dungeon are very representative of the feelings being experienced. Xena is confined by the wooden neck shackles, and Gabrielle helps her to carry the heavy weight of the board. Emotionally Xena has been weakened by these events, and Gabrielle is there to give her the support she needs. In return, Xena can see the guilt and self-recrimination that Gabrielle is experiencing, and she sets aside her own anger in order to reassure Gabrielle and ease her self-hatred. 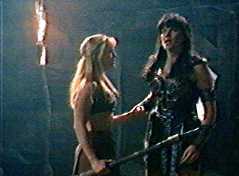 By allowing Gabrielle to scratch her nose, Xena signals to the bard that she still needs her and that she can move past the anger and forgive Gabrielle's betrayal. Both women find that the only way they can survive is by reaching out to the other half of their soul and showing their love and continued devotion. They realize that the loss of their friendship would be much worse than anything else they could face. Things *seem* to be resolved at the end of THE BITTER SUITE. The roller coaster of reality reaches its climax in the two episodes MATERNAL INSTINCTS (57/311) and THE BITTER SUITE (58/312), where some of the most powerful emotions were expressed between Xena and Gabrielle. Through all of the upheaval and feelings of betrayal and even hatred, the friendship between the two continues to be the key to survival. There were times during these episodes when it was difficult to see how the friendship could possibly survive. Too many hurtful things were either said or done. Too much heartache had been inflicted by both women and by the outside forces of Callisto, Hope, Ares, and Dahak. The reaction of Xena and Gabrielle to the deaths of Solan and Hope are images that are hard to forget. The verbal exchange after the funeral was agonizing to watch because, as viewers, we were aware of the toll these events were having on the characters' friendship and knew how each must be suffering because the love and support had been momentarily lost. Still, the key to survival was love, friendship, and forgiveness. There is no stronger reality than that. The events in Illusia clearly illustrated the effects of hatred and distrust, but more importantly, the events highlighted just how important the love and friendship between the two women were. Without this love, neither would survive their pain. The strength of this friendship is clearly demonstrated in the remaining episodes, and the events of SACRIFICE I and II (67,68/321,322) certainly serve as a powerful conclusion to a season that took the characters through many highs and lows. The ultimate act of love is the willingness to sacrifice one's self for another person. Both Xena and Gabrielle are ready and willing to do this, which shows that the traumatic events in the earlier episodes only served to strengthen their feelings for one another. There are so many challenges in our own lives that could destroy us and make us bitter, but the forces of love and friendship are the keys to our survival. I am truly grateful that the writers allowed Xena and Gabrielle to experience both the bitter and the sweet aspects of life in the third season. The reality of the relationship between these two friends is what makes this show the best one on television. I live in Indiana and teach high school English. I'm lucky enough to teach a World Literature class that includes Greek mythology. I have both a B.S. and a M.A. degree from Purdue University. I have been married for three and a half years now, and though my husband and I do not have any children, we do lavish plenty of attention on our two dogs, both Beagles. I have been a Hercules and Xena fan for over two years now, and one of my favorite hobbies is reading fan fiction. My favorite authors are Missy Good and B.L. Miller. When I'm not doing the "bard" thing, I'm an avid walker and hiker. I love nature, and the mountains and the deserts of the Southwest are a particular favorite of mine.